Entries are now open for the 2016 Inglis Select Yearling Sales Series covering six sales in two states, all conducted by the one Inglis Team. “Inglis have been committed to the thoroughbred breeding and racing industry for over 100 years and we are continuiously working towards raising the industry standard,” said Mark Webster, Inglis’ Managing Director. “We accomplished an outstanding clearance rate of 85% across our yearling sales this year, well above the Australia and New Zealand industry standard of 81% and welcome vendors to enter ALL their yearlings into our series for 2016 in order to present them to a worldwide buying bench,” added Webster. 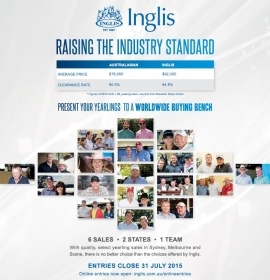 The Inglis Bloodstock Team led by National Director Jonathan D’Arcy will be on the road throughout the coming months and would only be too happy to assist vendors with feedback about which Inglis Sales may suit all individual yearlings to optimal results. “Not only do we offer Australia’s lowest commission rates, our expert team are on hand for support throughout the entire sales selection process and we again offer the our headlining yearling sales tailored to a comprehensive buying bench in order to maximise vendor success,” adds Jonathan D’Arcy.